If you had the opportunity to be at ‘Magicopolis’ in Santa Monica on the 7th of March you have my full permission to skip this blog, You already know how cool ‘Pop Haydn in the 21st Century!’ is! If you weren’t there then I advise you to get your tickets and catch magic’s favorite time traveler when he returns there on April 4th. ‘Pop’ is a creation from the fertile mind of one of magic’s most innovative and accomplished performers—Whit Haydn. 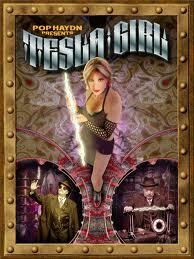 At a time where everybody in magic seems to have his own theatrical show this one is a little different. It isn’t just a performer doing an extended version of his show in a hired venue, but is both theatrical and a fully-fledged show. That’s a neat touch isn’t it? ‘Pop’ will be familiar with many magicians for his ‘Post Modern Medicine Show’ which has made numerous appearances across the United States and delighted audiences with it’s whimsical approach to a time honored and specialized style of entertainment. His new show ‘Pop Haydn in the 21st Century!’’ has taken many of these ideas and reformatted them into a delightfully textured and unique piece of show-biz hokum that delights audiences of all ages. Along with Whit on his time travel extravaganza are some other fine performers who assist in turning this event into a well rounded and not to be missed occasion. The ever-adorable Sophie Evans will be presenting her uniquely fiery sorcery and also acting in the capacity of ‘Tesla Girl.’ If you haven’t seen Ms. Evans weave her special brand of magic then this is the chance to enjoy her delightful talents. What is a magic show without music? Oh, it is just a magic show! Never fear— there is some mighty fine music accompanying the prestidigitation at this event, those attending will be serenaded by the Magic Castle’s own delightful Louisiana Songbird Ms. Bonnie Gordon. The musical director is none other than Prof. Dave Bourne and his ‘21st Century Boys.’ I have been a huge fan of the Prof. since first appearing with him at Milt Larsen’s ‘Mayfair Music Hall’ in the 70s. 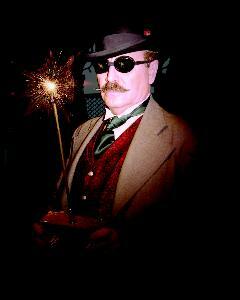 During the program, Pop Haydn will be demonstrating some of his most popular flights of fancy including his ‘Teleportation Device’ ‘Magnetized Water’ and introducing his astonishing new ‘Sphere of Destiny.’ It will be a treat for magicians and steampunk lovers alike. No two performances by Pop Haydn are identical, so buckle up your seat belt, as there might be some radical surprises in store. Tickets for the show are available via www.pophaydn.com where you will find a great many more details about the upcoming show. ‘Magicopolis’ is the extremely successful brainchild of magic’s original bad boy—Steve Spill, and its intimate style seating for a mere 150 people almost insures a sell out. Take my advice and book your seats early, you never know if Pop will get it into his mind to skip back in time a century or two and re-invent history all over again, for the first time! ~ by Nick Lewin on March 15, 2013.